An unpiloted Air Force space plane glided back to Earth Friday after a record 674-day stay in orbit, closing out a clandestine military mission with a computer-controlled landing at Vandenberg Air Force Base, Calif. The Boeing-built X-37B Orbital Test Vehicle, wrapping up its second long-duration mission and the secretive program's third flight overall, touched down at 12:24 p.m. EDT (GMT-4; 9:24 a.m. local time), rolling to a stop a few moments later. Other than a brief Air Force statement last Friday announcing landing preparations at Vandenberg, there was no advance warning of the space plane's re-entry and, in keeping with the secrecy surrounding the program, no details on what the spacecraft might have been doing during its nearly two years aloft. In a brief statement released shortly after landing, the Air Force said "the OTV-3 conducted on-orbit experiments for 674 days during its mission, extending the total number of days spent on-orbit for the OTV program to 1,367 days." "The 30th Space Wing and our mission partners, (the) Air Force Rapid Capabilities Office, Boeing and our base support contractors have put countless hours of hard work into preparing for this landing," said Col Keith Balts, 30th Space Wing commander. "I'm extremely proud of our team for coming together to execute this third safe and successful landing." It was the first official update on the spacecraft since launch from the Cape Canaveral Air Force Station atop a United Launch Alliance Atlas 5 rocket on Dec. 11, 2012. "The landing of OTV-3 marks a hallmark event for the program," an unidentified program manager said in the Air Force release. "The mission is our longest to date and we're pleased with the incremental progress we've seen in our testing of the reusable space plane. The dedication and hard work by the entire team has made us extremely proud." The secrecy surrounding the X-37B program has prompted widespread speculation about its mission. Some have suggested the spacecraft has been used to test advanced space sensors or possibly to carry out remote inspections of other spacecraft. An Air Force fact sheet says technologies being tested "include advanced guidance, navigation and control, thermal protection systems, avionics, high temperature structures and seals, conformal reusable insulation, lightweight electromechanical flight systems and autonomous orbital flight, reentry and landing." The Union of Concerned Scientists has questioned the value of the program, given high launch costs and the infrastructure needed to support a reusable spacecraft. "One mission that seems to be frequently suggested is a maneuvering sensor to look at 'hot spots' on Earth," Laura Grego, a UCS senior scientist, said in a blog posting Wednesday. "The space plane may be able to do that. But the problem is that the ability to maneuver and the ability to return to earth work at cross purposes. "Returning to Earth requires massive landing gear and heat shielding, which is like putting rocks in your backpack when you're trying to be agile. It's not well-suited. This mission could be done much better and cheaper using other platforms." As for the stealthy nature of the X-37B program, Grego wrote "there is nothing stealthy about this craft." "It is easily observed from the ground and because of all the extra mass must be launched on a large rocket (Atlas V)," she said. "So while the space plane may be carrying advanced sensors to orbit so that they can be tested and returned, roving or stealthy sensors are not a good missions for it." But the Air Force apparently has long-range plans to fly the X-37B. Last week, NASA announced the Air Force would be taking over two of the original three orbiter processing facilities at the Kennedy Space Center where the agency's now-retired space shuttles were serviced after landing and readied for their next mission. It had long been expected that the Air Force would take advantage of the OPFs and Kennedy's 3-mile-long shuttle runway for the X-37B project to reduce the cost of servicing the space planes between flights. 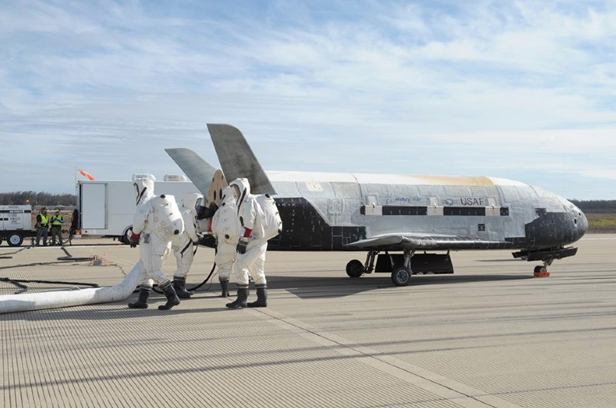 The three X-37B missions launched to date took off from Florida and landed in California. Boeing is expected to complete modifications in the OPFs by the end of the year. Presumably, the next X-37B mission, whenever it occurs, will launch and land in Florida. The automated spacecraft resembles a mini space shuttle with stubby wings, a compact payload bay, maneuvering thrusters and heat-shield tiles. Unlike the shuttle, which relied on hydrogen-oxygen fuel cells to generate power, the Air Force space plane apparently uses a deployable solar array that extends from the craft's payload bay. It also features more lightweight composite materials, improved wing insulation and tougher heat-shield tiles that "are significantly more durable than the first generation tiles used by the space shuttle," according to a Boeing website. "All avionics on the X-37B are designed to automate all de-orbit and landing functions." The vehicle that landed Friday carried out the OTV program's maiden flight, taking off from Cape Canaveral April 22, 2010, atop an Atlas 5. The spacecraft spent nearly 225 days in orbit before gliding to a computer-controlled touchdown at Vandenberg. A second X-37B was launched on March 5, 2011. It spent 469 days in space, landing June 16, 2012, at Vandenberg. The original X-37B, the one that landed Friday, returned to space on Dec. 11, 2012. NASA developed the original idea of a small winged orbiter, which was built by Boeing Corp.'s Phantom Works division. But the program was turned over to the Pentagon's Defense Advanced Research Projects Agency, or DARPA, in 2004. The Air Force took it over in 2006. "As with many other advanced technology test programs, some details of the mission and test requirements are classified or sensitive," an Air Force spokeswoman told SpaceflightNow after the program's third launch. "The focus of the program remains on vehicle capabilities and proving the utility and cost effectiveness of a reusable spacecraft. "One of the most promising aspects of the X-37B OTV is it enables us to examine a payload system or technology in the environment in which it will perform its mission and inspect them when we bring them back to Earth." But that launch pad-to-runway architecture is inherently expensive, requiring a large booster, high-tech materials, avionics and an autonomous landing system. "These are interesting technologies, but returning to Earth ... isn't a mission, it's a technology," Grego wrote. "Why classified, though? "It's a well-resourced classified military program, so will generate plenty of raised eyebrows and interest in similar technologies in other countries," she wrote. "Is it worth it? We have yet to hear anything approaching a convincing argument."